Many aspects of how rabbits are put together are a mystery to the people who have them. This article is to help unravel one of those mysteries for you, a rabbit’s vision. We see a broad color spectrum with lots of depth perception to help us navigate the world around us. Rabbits being prey animals, have evolved with eyes on both sides of their head in order to see 360 degrees. This is so they can always be on the lookout for approaching predators. Ironically, a rabbit has a blind spot directly in front of their nose. Their whiskers and smell are normally used to detect things in that area (and sometimes their teeth). Bunnies are far sighted and do not see very well up close. They also tend to see in greens and blues because most of their food is green stuff. Rabbits see things in two dimensions. They do not easily tell distance and have virtually no depth perception. They can see a cat, but cannot visually tell if it is ten feet or fifty feet away. Their vision can identify a cat, but they tend to use their other senses such as smell and hearing to determine how far away it is. When a rabbit sees things with both eyes, he sees a flat picture that is similar to page in a coloring book. Imagine taking one of those extra wide panoramic pictures and wrapping it completely around your head and then being able to see the whole picture at once. This is hard for most people to imagine and conceptualize. This is why we don’t easily understand a rabbit’s vision. It is absolutely nothing like our own. Then add to that the lack of a full color spectrum and the inability to see things up close and now you are beginning to understand a rabbit’s vision. This is why they tend to rely more on their hearing and sense of smell to alert them to danger around them. Their vision is important, but for up close work (like eating) they use their nose more than their eyes. I often have people ask me about a common rabbit phenomenon called, eye scanning. It is a bit disturbing the first time you see it and it consists of a rabbit kind of weaving and bobbing like a drunk person in order to look at something. The first time I saw it, I thought the bunny was developing some kind of neurological problem or MS. It turns out that it is more common in red eye bunnies, but I have seen a couple of non-red eye bunnies do it, as well. Usually the bunny will be sitting upright and his head will kind of weave from side to side. If you look closely, you will see that he is eying or looking closely as something, switching from one eye to the other in his gazing at it. What he is actually doing is trying to get a better look at something, by using both eyes to view it. I think that for some rabbits, it helps them better gauge their surroundings. I think that they do it more when they are unsure of a location or curious about what is happening nearby. My big New Zealand bunny does not care for cats and will thump whenever she sees or hears them. Often, she will start thumping and I cannot figure out what she is alerted to. Then I will see a cat way way off in the distance that she is seeing. To her she just sees a cat. She does not know if it is ten feet away or over one hundred feet away, like it really is. 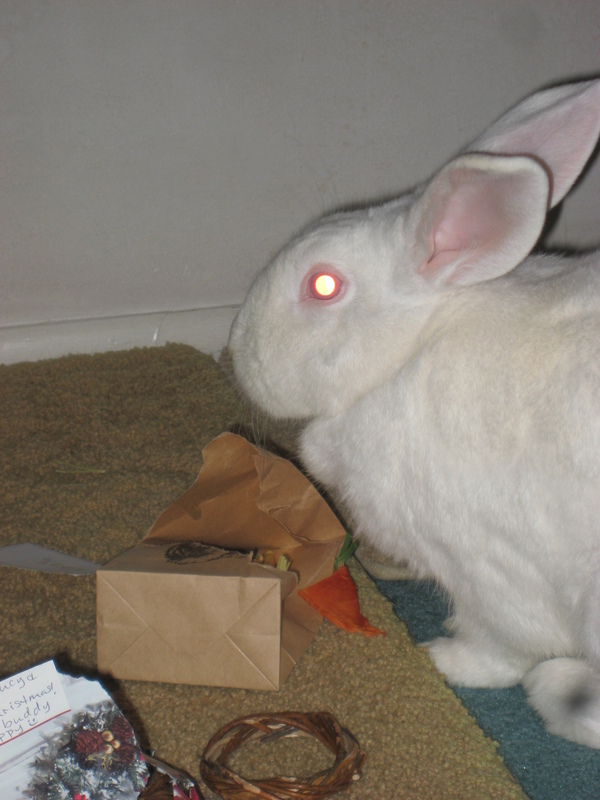 Another common mystery is, why rabbits have red or pink eyes. This is actually the result of albinism. It was intentionally bred into bunnies in order to have a blood line that would produce all white bunnies all the time. Albinos of all species have pink or red eyes because it is due to the complete lack of pigmentation within their bodies. Normally it is a mutation, but this mutation has been bred to exclude all other varieties, in rabbits. This is usually a recessive trait in most species and so when any genes are present to give color, the color is dominant and will be present. However, it is possible for a non-albino to give birth to an albino (all white with pink eye) offspring due to both parents have the recessive gene hidden in their DNA. Albinos are sensitive to sunlight, due to their lack of pigmentation and red eye white rabbits are no exception. They can find glaring bright sunlight a bit annoying and will often seek shade to comfort their sensitive eyes. Keep this in mind when taking your red eye bunny out and about. Their sensitive eyes and skin do not like hot direct sunlight. I am going to be brutally blunt here, right off the bat. If you cannot afford or are unwilling to pay for emergency medical care for your rabbit(s), then you probably should not have one. Rabbit vet care can be very expensive. It is just as pricey or even more so than vet care for a dog or cat. People routinely are faced with $1000+ bills when a bunny gets sick and needs medical care. It is not a matter of “if” you will get one of these bills when owning a rabbit, but simply “when”. As with all creatures, the older you get, the more you will need to see a medical professional. Because rabbits are exotic pets, they will need to see a specialist. Dog and cat vets simply do not have the expertise or knowledge to treat your sick rabbit. Do you want your doctor looking up how to treat a serious illness on the internet before he treats you. It does not instill confidence or give you much hope when you know that your doctor is treating or seeing a medical problem for the very first time. A rabbit specialist is critical for your pet’s survival, when he is seriously ill. If you care about your pet, you want to give him the best chance at making it and so it means you must use a more expensive rabbit specialist vet to provide the best care possible. After having lost a couple bunnies to dog and cat vets, I cannot stress enough how important it is to have a rabbit specialist vet available when your bunny needs one. This is definitely going to cost you something and bearing the expense is part of being a responsible pet owner. Would you not take your children to a doctor or dentist if they were sick or in pain? Would you not find a way to get them care, even if you could not afford it? It is the same for pets. You must find a way to get the proper care to a sick animal, regardless of the cost and whether you have the funds readily available. IF this means putting it on a credit card or finding a friend to let you put it on their credit card, it just needs to be done. You don’t hesitate and let someone die because it is not convenient or affordable for them to live. What defines us as a society and as human beings is our reluctance to accept and allow others to suffer. To turn your back on an animal or other creature that needs your help, makes you less human. To be human is to empathize and feel the pain that others feel. It is part of what we are as a species. So I get back to my point. You have a responsibility as a pet owner to provide good and proper care for your charges and do all in your power to prevent abuse and suffering. This translates into a huge weight that must be shouldered when you have several pets and maybe even some human children, too. I have met many families who have several children and a house full of pets on top of that. Most of them are very responsible and provide very well for them. What worries me is when I hear people making excuses about avoiding expenses and vet care that they know are necessary. The bottom line is if you cannot afford five or six kids, two dogs, three cats and two bunnies, then what in the heck are doing getting in over your head like that? I know it is with good intentions that we take on such huge responsibilities, but why burden you and your family with what you know eventually will become unbearable? It is only a matter of time before a menagerie like that will become very expensive. Should you really be taking on that third dog, that sixth bunny, that tenth cat. Some of us try and rescue every critter that needs our help, but I can tell you from experience that rescue work can easily become a full time job. It takes a lot of dedication to have a full time rescue job, especially if you have a family, too. All the work and time are nothing compared to the expense that can be incurred, regularly. I have seen more than one family go broke trying to rescue animals. This is why rescue is best done in a group where the time, expense and responsibility can be shared. I know that there is a fine line between rescue and hoarding pets. To me, when your “rescues” are being harmed by your inability to provide proper care, including medical care, then you have crossed the line. I recently met a family who has spent an enormous sum of money to spay and neuter a large unexpected litter of bunnies. Even with discount services and HRS rebates, their expense for this stretched the family budget to the limit. They were trying their best to cope with ten bunnies that were now part of their family, but it was a disaster waiting to happen. The number of times your bunnies will visit a vet seem to be directly related to the level of experience you have as a bunny lover. The less you know about bunnies, the more often you make mistakes and the more likely you will be making frequent vet visits. I always tell people that it is a long journey to learn about rabbits. It takes time and you will make mistakes. Now multiply this inexperience factor by ten rabbits and it is almost guaranteed that there will be more vet bills to follow. This is where you must make a decision. How do you afford the inevitable vet bills for so many bunnies? If you are independently wealthy or make a lot of money, that is good, but what about the average person? How do you afford so many rabbits? There are pet medical insurance policies but they can be impractical, since they charge by the animal. Five or six animals would end up getting expensive with just the monthly premiums, alone. Anecdotally, the family with ten rabbits suddenly found that half of their buns were very sick. They were in dire need of a vet, but now they are seeing an impending vet bill TIMES FIVE! They were already strapped for money from spaying and neutering all of those rabbits. To save money, they wanted to take one bunny in to the vet and hope that they could get enough medications to treat all five. I am not saying that was not a well intentioned plan, but how do you decide which bunny gets to see a doctor and which ones will not? Do you see where I am going with this? This is where you have to ask yourself, is ten rabbits too many for a family who cannot afford them? I cannot answer that for them, but I know that the answer for me is, yes.